I made plans with Giulia several weeks ago to have lunch during Restaurant Week. 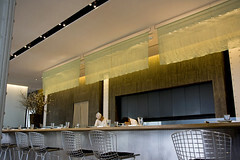 I’m itching to try out new restaurants rather than my safe and dependable restaurants during this time of the year (e.g. 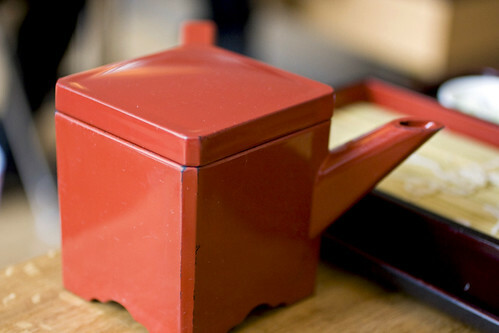 Gramercy Tavern and Eleven Madison Park), so I proposed Matsugen. I heard generally good to very good reviews around the web so I thought this place wouldn’t let me down. Arriving around 12:30, I waited in their lounge section of the restaurant while Giulia was driving into the city. 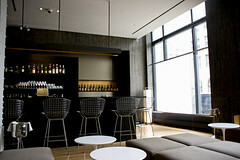 The decor is understated, refined yet trendy enough for the hip neighborhood of TriBeca. Upbeat music playing softly in the background, a bit unexpected for an Asian themed restaurant but it’s fine by me. As the hostess escorted to our table I’ve noticed, strangely, that the dining area is partitioned into three small sections rather than one relatively large dining space. Perhaps it’s meant to feel more intimate? Anyway, when Giulia and I were perusing the menu, I was hoping that they would actually serve their “Winter Promotion” lunch bento box menu that’s currently online, which reads the following: Green Salad with Soy Sauce, Homemade Soft Tofu, Goma-dare Soba, and Black Cod Miso for $24. 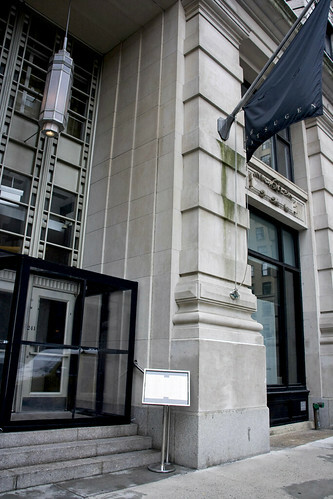 However, the actual Restaurant Week prix fixe (I forgot to take a photo; a rare thing but it did happen) of $24 read: Green Salad, Mushroom broth with soba, Grilled Fish (which turned out to be salmon, observing from neighboring tables), and vanilla pudding. If you asked me, it sounded very depressing that I even asked the waitress if I could substitute the entree? 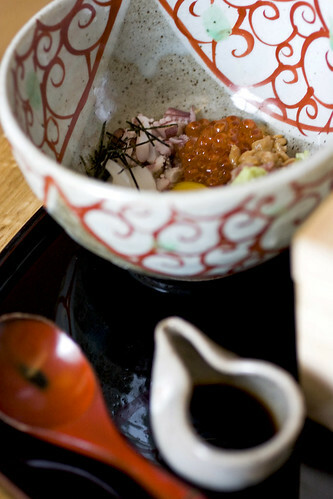 We started with the Bakudan, a bowl filled with an assortment of raw or barely cooked seafood (scallops, calamari tentacles, salmon roe, uni, and shrimp) and natto beans with a side of nori sheets. What stood out from most of the appetizers that were on the a la carte menu were the natto beans and uni. I love uni’s silky texture and how it tastes like the briny sea. As for natto, I never had it before. When I tried, it tasted a tad salty like soy sauce (it is fermented soybean, ya know?) but then the flavor changed to coffee. It was weird yet I liked it a lot. Texturally speaking, it’s still soft and creamy like any typical bean one would eat. Mixing the barely poached egg yolk with all of the ingredients and eating it with the nori, this was interesting to eat. The nori gives it the salty, briny flavor with some crispness, the bakudan mixture is chewy, silky and the natto’s coffee flavor that lingers on the palate. Progressing onto the mains, I’ve ordered black cod with miso and cold soba with Kamoseiro duck soup. 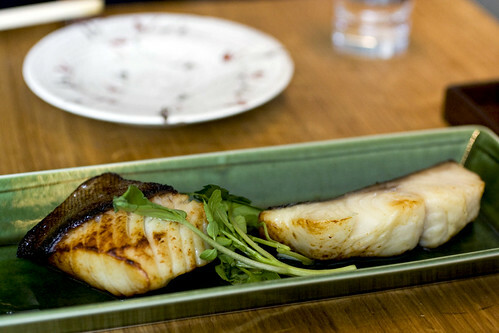 The black cod was simply amazing. It’s perfectly cooked, moist, and the fish is fluffy. The sauce that’s coated the cod was sweet and salty. I wouldn’t have mind eating several orders of this dish. 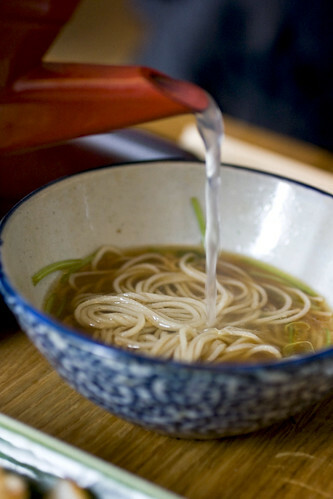 The cold soba with Kamoseiro duck soup was a pretty generous portion of cold soba noodles that’s served with a small bowl of salty, flavorful duck broth. This particular dish is comfort food for me in the winter – a hot bowl of soup and noodles, hence the reason why I ordered it. The plus was, there’s four slices of meaty, tender (with a touch of fat) duck in there absorbing salty flavors in the warm soup. How we’re supposed to eat it, as the server told us, we take the soba noodles and drop it in the hot bowl of soup to be warmed and eat it. The cool, red kettle was given to us when we’re almost done (see pictured above); it’s meant to dilute the salty broth and it warms it up so we can drink it. This was very good and Giulia and I were satiated by the time we’re done with our meal. I didn’t bother with dessert since I’m running late and she has to go to another engagement. Would I go to Matsugen in the near future? Yes, but wouldn’t bother with their Restaurant Week menu. I do hope they’ll switch back to the aforementioned “Winter Promotion” menu soon since I heard really good things about their soft tofu (and I do love my tofu) and the goma-dare soba, then I’ll think about coming back. You got some beautiful shots. Ooooh, thanks for letting me know about this RW menu thing. I remember hearing about their winter promo menu from JVG’s own blog, but it’s kind of lame that they’re backing out of it during RW. I agree with Joan. You’ve a really cool eating habit and nice to see the pictures you’ve shared. Thanks and keep it rolling. Disagree with respect to Restaurant Week menu for Dinner. I went last night and it was full of variety and perfectly portioned. First course was Miso soup with soft tofu followed by amazingly marinated hamachi, mid was an assortment of small plates including crispy shrimp and sushi, and finally a choice between the soba you had and a mushroom broth soba. We added the braised pork belly. 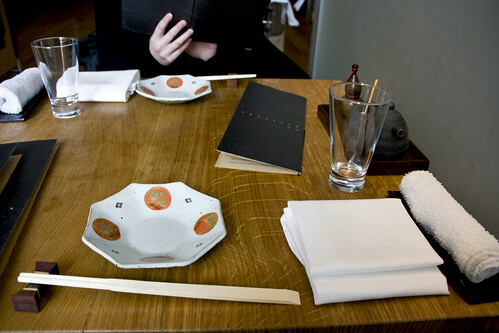 All together, it was a very well designed menu with a good amount of variety. I definitely want to return to try the off-set menu items. Danny: Yeah, it was a bummer. Raf: I’m just telling you and all of my readers how I experienced lunch. I didn’t say it was for both Restaurant Week lunch and dinner. If Matsugen kept the Winter Promotion lunch menu, I would have been happy but I tried replicating (within my friend’s budget and splitting the meal; the only thing that was from the original menu was the black cod miso) for this lunch and it worked out. Thankfully, we aren’t starved women before we would’ve bought something after eating here. 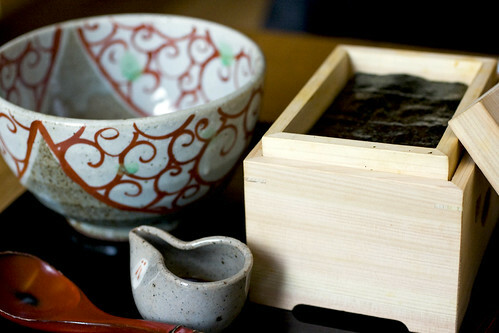 Natto – OMG! I eat a lot of weird things like swallow’s saliva and intestines but even I can’t like natto. It looks like melted aliens to me and smells like an incubated stinky sock (I also love the chinese stinkie tofu.) So kudos to you. 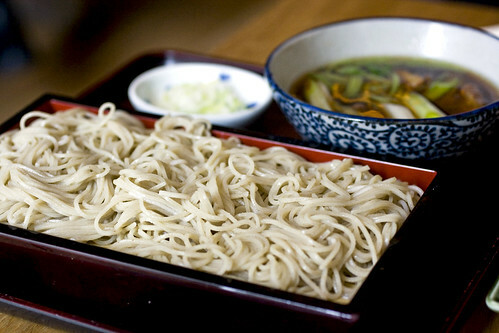 I am going to try the soba with duck soup broth, sounds more flavorful than the ususal soba broths. 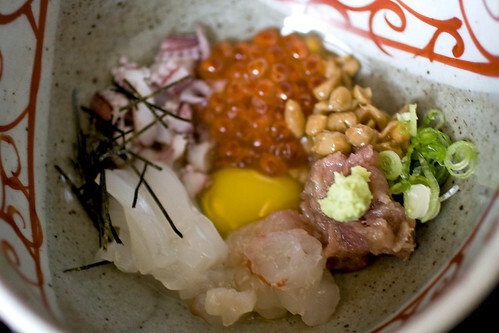 amedemonet: I how can you NOT like natto?! I’ve eaten swallow’s saliva (tastes good) but not intestines yet… Thankfully my parents didn’t make me eat the latter when I was a kid. The duck soup is one of the safer things we’ve (as in Giulia and I) eaten for this particular meal. I went to Matsugen for RW dinner, and I thought the best part was the vanilla caramel pudding. It’s a shame you didn’t have time to try it. Jessica: I’m not much of a pudding person. I mean, I do like pudding but not obsessed about it (like macarons). If Matsugen did have their grapefruit jelly as part of the prix fixe, then I would start moping about it.